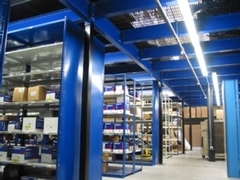 Together with Borroughs, FSS can provide expert advice and assistance in designing and installing multi-level systems. Using Configura®, they have the ability to generate 3-D drawings and plan views which provide enhanced visualization of your system. They can create a unique system that will deliver the maximum amount of storage space for every dollar you invest. They can also provide optional accessories including lifts, conveyors, pallet jacks and other items to make storage and retrieval of your parts faster and easier.